A monotypic genus, see below. Have a look at the fundatrix, pictured. The first time I saw this, I thought of termite queens. This is one of the most extreme examples of a fundatrix I have seen. 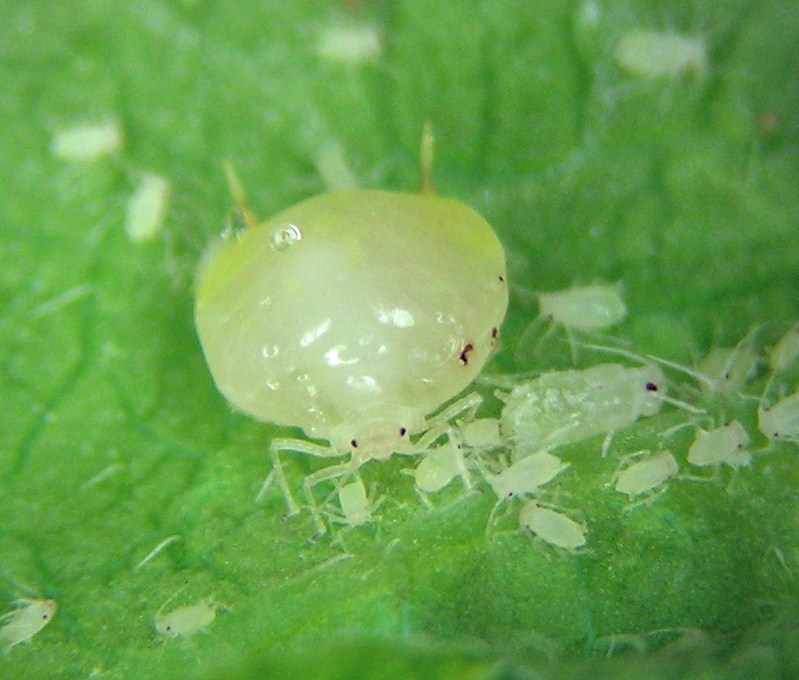 These occur in somewhat rolled leaves of the host plant, Philadelphus lewisii. Often finding a fundatrix means finding hundreds of her offspring too. I have found this species in Washington, Oregon, and Idaho. It clearly migrates to a secondary host, and like Blackman and Eastop, I suspect that it migrates to mosses and I think it may be closely related to Myzodium. Glendenningia philadelphi fundatrix and nymphs near Hayden , Idaho.